Army Public Affairs Broadcast Specialists are involved in creating, filming, reporting, hosting and editing news and entertainment radio and television programs. Public Affair Broadcast Specialists are primarily responsible for participating in and supervising the operation of audio or video news for Army units or Armed Forces Radio Television Service (AFRTS). Prepares scripts and news copy for Armed Forces Radio and Television Service radio and television programs and participates as host, announcer, master of ceremonies, and actor in radio and television broadcasts. Research, prepare and disseminate information through news releases, radio and television products. Perform as writer, reporter, editor, videographer, producer, and program host in radio and television productions. Perform operator level maintenance on assigned equipment and maintenance on assigned vehicles and generators. 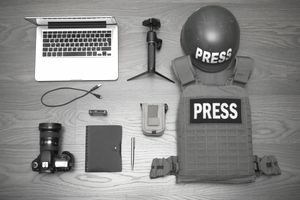 Job training for public affairs broadcast specialists requires 10 weeks of Basic Combat Training and 12 weeks of Advanced Individual Training with on-the-job instructions. Part of this time is spent in the classroom and part in the field, where you’ll learn hands-on how to operate a video camera and program a 30-minute disc jockey show. You’ll also participate in a live-to-tape television newscast where you’ll work as anchor, control -room operator, director, and cameraperson.